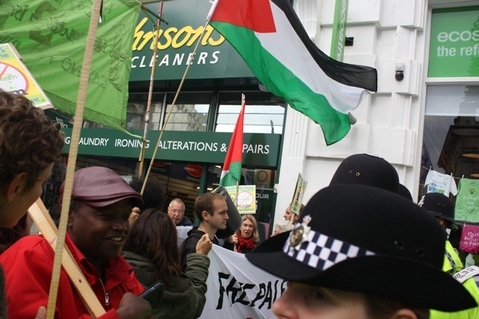 Brighton and Hove citizens of conscience were out in force on Saturday September 28th to raise awareness of SodaStream’s deep complicity in Israel’s record of war crimes, colonisation and ethnic cleansing. As part of a national UK day of action, with SodaStream stockists all over the country being targeted, we took the message to the streets of Brighton with a rally at the Clock Tower followed by mass visits to the main stockists in the town, ending at the company’s EcoStream store in Western Road. 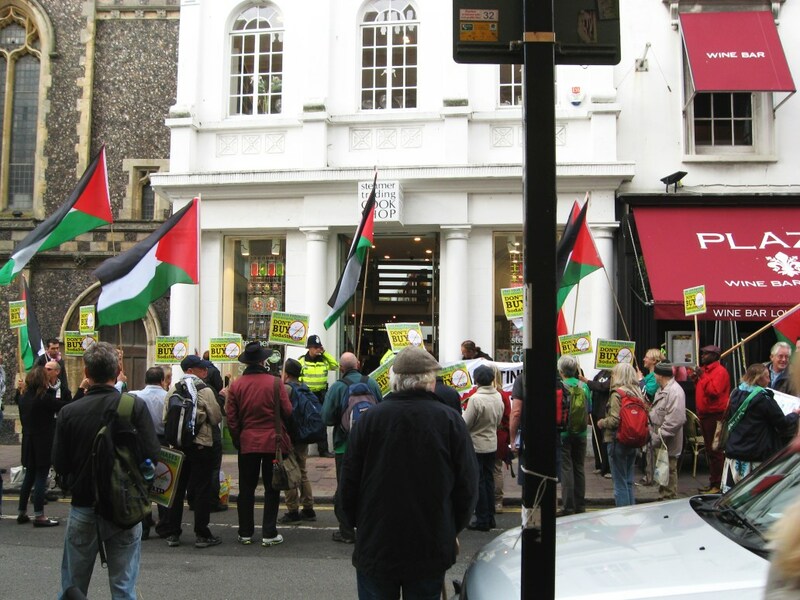 We then marched through Brighton, paying mass visits to Steamer Trading, Robert Dyas and Argos – all in their own way profiting from Israeli war crimes by stocking SodaStream products. We handed letters to the shop managers, leafleted local shoppers and spread the word about the importance of boycotting SodaStream and other complicit companies. 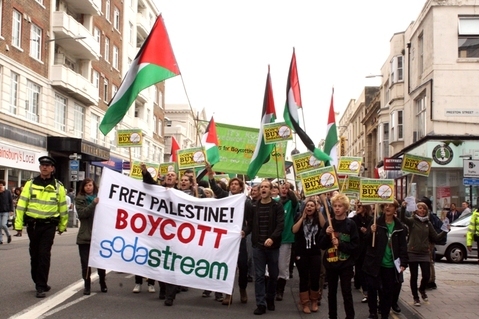 The march culminated with our arrival at SodaStream’s dedicated shop in Brighton, EcoStream – a large, colourful and noisy reminder to the shop’s managers that Brighton will never accept business from illegal Israeli settlements. Between us, and the counter-protest by a few local zionists, it was difficult to see how the shop took any money at all! A magnificent day of action! Thanks to all our supporters for helping to make it such a success. Watch this space for more photos and personal stories from the Day of Action. 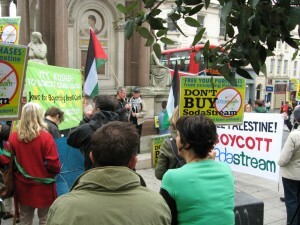 Learn more about the actions around the UK on the PSC’s national website. Learn more about BHPSC’s long-standing EcoStream protest.